Feel free to ask anything about Heroes 2 modding here, and we will try to answer. How can I help to translate Ironfist in French or any other language?? Basically, our translation support will probably be something like this: There will be a list of pieces of game text, and their translations. Before the game shows a message, it looks for a translation. Because if I replace english words by french in the txt files, it may be "difficult" to transform it in an "usable" translation file. I want to try to design a h2 creature. Any tips for doing that ? I saw the main thread and I love the new creatures. Yes. However, like I told you on Heroes Community, working with Heroes 2 is a very hard thing in comparison with Heroes 3. If you are still ready for info, here it goes. I must note, however, that Phoenix' beautiful animation is implemented via color cycling, as well as Magi's staff, Fire Elemental's body and some others. It is done with simply 1 frame which uses colors in the range of 214-217 (red), 218-221 (yellow), 238-241 (blue). The numbers are the specific color indexes in Heroes 2 256-color indexed palette. To work with this palette, you can use such programs as MtPaint. Heroes 2 palette (bmp file) can be downloaded from this link. MtPaint can then load this palette (see Palette -> Load Palette). If you make any single color that stands out from Heroes 2 palette, the game will be likely to crash or your sprites will be displayed with errors. Now on to adding new creatures. I must note that there is currently only 2 ways to add new creatures: either to Heroes 2 using Project Ironfist tools, or to Heroes 3 using standard Era tools. You cannot add new creatures to a clean Heroes 2 game because it is not prepared for such operations. You can only replace the graphics for existing creatures keeping the same frame quantity/order. The statistics and names for creatures can then be hex-edited (if you still work with a clean game; Project Ironfist allows to change creature stats much and much easier). That's a great explanation Orzie ! It give wants to make H2 designs ! 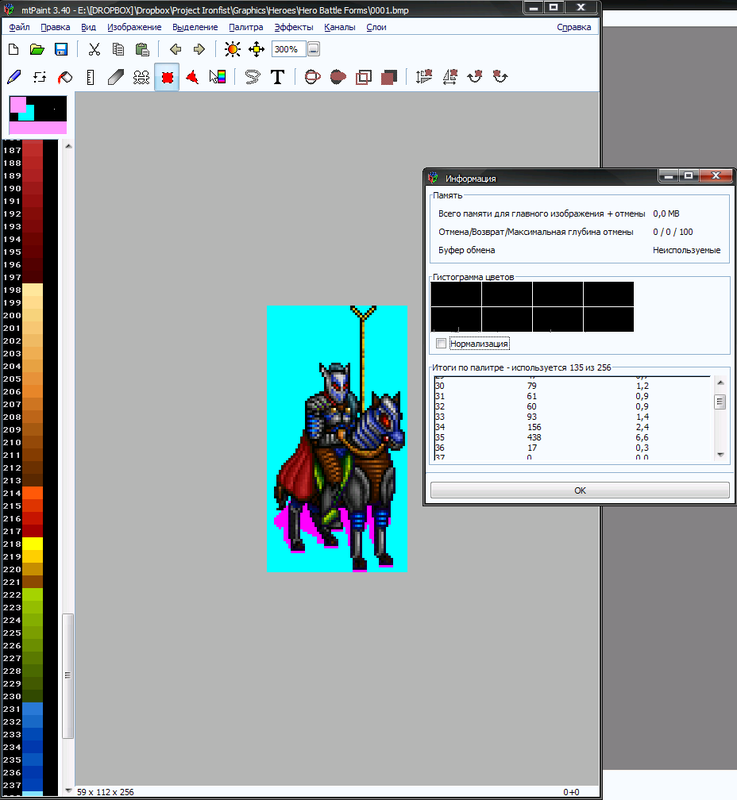 Can you "convert" a normal image (Zounds of colors) to H2-256colors image with btPaint? Do we must save the result(animation of the creature) image by image? The color cycling is an in-game feature. Simply put, if you place color 214, it will be put in a cycle automatically: 214-215-216-217-214-... etc. If you start from color 215, it will go in the game like 215-216-217-214-215-... etc. This is how Heroes 2 are programmed to cycle specific color indexes. The same cycling order goes for other color ranges I mentioned (by 4 colors), but there is one additional range which don't follow that rule. It is the ocean/river/lake colors (231-237). I won't talk about it in this message because I'm in a hurry and this range is more tricky, but you can surely save this question for future if you will need to work with oceans/rivers/lakes. So, simply put, you place only 1 color, and the game does the rest. In MtPaint you should press Image -> Convert to Indexed with a pre-set palette. In Photoshop you can do the same operation - load a custom palette (the one which I posted in my previous post) and convert the image from RGB to Indexed. Photoshop CS3 seems to have some problems with that operation, but I was not able yet to track the reason. Definitely like that. That is how original frames for creature sprites are stored in the game. You should download GrayFace's tools and open one on the creature .ICN files. You will see a list of frames. There are some additional tricky things about the animations (like the creature coordinates in Moving frames), but we can save it for later. Good luck! I would recommend to try varying an existing creature first. 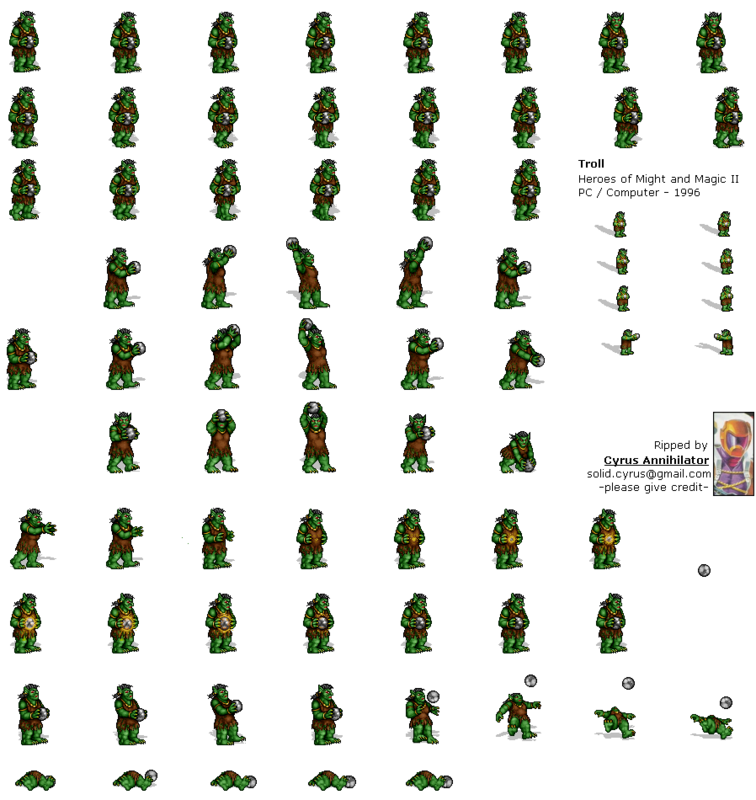 Note that you cannot use spritesheets from Spriters Resource or whatever - they are converted to 24 bit PNG with transparency. You should use GrayFace's AggUnpack and IcnUnpack programs on your respective data files to get the genuine sprites. You can use any program you like. The only requirement is to work in the certain palette - the Heroes 2 palette. MtPaint just allows you to easily check what palette you use, and switch between palette colors - just click on the left panel with color indexes and you will choose the clicked color to draw. The grid size is the same in H1, H2 and H3, if we speak about the adventure map. So that, yes, it's 32x32. If H3 sizes were different from H1-H2, there would be no H3SW, I think. The object replacement might have become too difficult. Is there any program I may use to change the stats and the prices of the creatures in Heroes 2 The price of loyalty ?? I know one program- Project Ironfist, but it changed other things in the game too (like recruiting a Retreated hero who have not movement points and adds new creatures). I found also a program of AlexSp- Universal Balance Patchet v1.1, but it works only with russian versions of heroes2w.exe. I have only russian .exe files, but not the other files in russian language( like HEROES2.AGG). So I could not launch the russian heroes2w.exe files. I just search for a program to change only the prices of the creatures. No, it's not possible for a non-programmer other than the ways you already mentioned. There are some solutions though. First, I can send you all the necessary files from Russian H2 localisation, including the AGG files. Also I recommend visiting Lands of Enroth, a good-looking site maintained by GodRage. He keeps some interesting stuff in the download section and he is an author of Archangel Patch, so probably he has some tips how to change the stats, too. Yet, I doubt he created a specific tool like AlexSpl did. Another option is to ask Darmani who is the co-author of another unofficial H2 balance patch. If he does not respond via any of the contact means given on the forum or Ironfist Website, I can help. Finally, I can contact AlexSpl and ask for tips since we chat every evening on HeroesPortal.net. I opened the site with- Archangel Patch, but there are not any tools for modding the prices or stats of creatures. Today, I also found several versions of Heroes 2 The Price of Loyalty in russian language, BUT ..... I don't like it. All of the russian versions have a problem/bug. When I click on my hero- I can not see the correct number of the creatures in the low right corner. I like the Original names of the creatures- Minotaur king, Ogre lord, etc. They are normal names for me and It is pleasure to play the game. I think that the prices of lv.5 and lv.6 creatures must be higher than the original prices. Because lv.1, lv.2 and lv.3 creatures at the same price as lv.5 and lv.6 creatures, are weaker. Also It is better to have 1 creature with many hit points( 300 HP) than many creatures with 1 or 2 hit points/HP, because the creatures with few HP will constantly lose in battles some creatures in the stack. But the stack with Powerful creatures will stay the same as in the begining or it will increase in numbers. Can you help me to find an English tool/ program to change the prices of the creatures ? This site hosts EXE files from different Heroes versions. Heroes2.agg files should be there too. Today, I also found several versions of Heroes 2 The Price of Loyalty in russian language, BUT ..... I don't like it. All of the russian versions have a problem/bug. That only means that you got wrong Russian versions. Everything should be okay in the official localisation by Buka company. I already told you that there is no such tool. I have given you the contacts of patch creators for H2 - Darmani and GodRage. The best action now is to ask them how they managed to change the stats. I will ask AlexSpl if he has an English adaptation of his tool on today's evening. [...] I have only russian .exe files, but not the other files in russian language( like HEROES2.AGG). So I could not launch the russian heroes2w.exe files. If I understood well you have Heroes2w.exe in russian but AGG files in english. If you want to modify prices of monsters, you will need HEXA decimal editing. I used Notepadd++ with its (native?) ability to show the Hexadecimal code of any file. Then, I would tell you that each localised exe have the data at different places. So, in french exe creatures table starts at 101F07 but english exe starts somewhere else. So, to find the first creature in your exe, you will have to search for "0014" because 14 gold is the price of the peasant. or so, whatever your want to modify, you can "translate" the values in hexadecimal and then search for the numbers... like if your monster have 25-50 damages, you will search "1932" in your file. Did I said too much? Not enough? Feel free to ask. Maybe It would be better to open a new topic for the Hexadecimal related hand-modding. Thank you very much! That's a very interesting insight. And yes, the information you presented may be very valuable. If there will be more requests for changing creature characteristics, probably there will be a great sense in creation of such thread. If you have good morale , you can start even now. Anyhow, the discussion can proceed in this thread too. If we will feel a desire to create a specificated thread, we can always do it with the use of info presented here. There is a lot to say about hexadecimal editing... So for now we continue in this thread and if we start to extend over pages, I may split messages in another thread plus making a page on Lands of Enroth, to make the data research more easy. I also left a question on Russian handbookhmm.ru forums regarding the hex-addresses in different EXE files. Let's see if I can get some answers too. Yes good site. You can find there building and spell editing too! Hero skills is modable too. For stats in russian Бука version you have special editor! Thank you GodRage. That program may change the names in the game. But how can I change the numbers in the game with that program ? I can not see any stat of creature with it.